In this topic you will learn how to manage the users that have access to Studio. The Manage Users page manages the users who are authorized to use the Studio. Note that to access the Users page, you must be a user with the Administrator role. 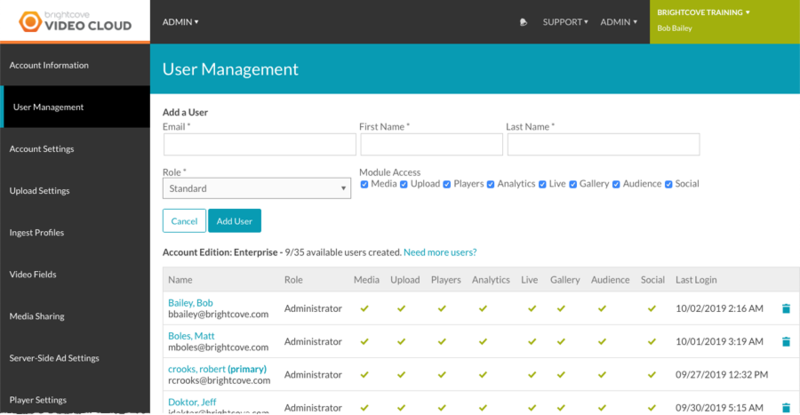 In the navigation header, click ADMIN and then Manage Users. The number of users you can create depends on what kind of account you have. If you need to add more users, you can upgrade your plan to one that offers more users. The limit applies only to the total number of users in existence at any time; if you create 10 users, delete 5 of them, and create 3 more users, you are considered to have 8 users. The Users page displays how many users you are entitled to and how many additional users you can create. If you need to add more users, you can upgrade your plan to one that offers more users. Pro and Enterprise level accounts should contact their account manager for information on adding additional users. Enter the Email, First Name and Last Name of the user. Select the modules the user has access to. Turning off modules only limits which sections of the UI the user has access to. The user will receive an email message stating that they have been added to the account. Click on the user to edit. The user details will appear at the top of the page. Note: The user that you logged in as cannot be edited. Click the delete icon ( )associated with the user. One user in each account is designated the primary user. The primary user will always have the Administrator role and can only be deleted by Brightcove Support. If you need to change the primary user at some point, select the new primary user and then click Make this user the primary administrator for this account. You will be prompted to confirm the primary user change. If the new primary user has a role of Standard, they will be assigned the Administrator role when they are made the primary user.